SALT LAKE CITY, Nov. 14, 2013 -- Dan Farr Productions DBA, Salt Lake Comic Con (SLCC) (http://saltlakecomiccon.com/) announced today it will hold two Comic Con events in 2014, including a 2014 Salt Lake Comic Con FanXperience (FanX) on April 17-19, 2014 and the Second Annual Salt Lake Comic Con 2014 on September 4-6, 2014. The decision to produce two events in 2014 was based on overwhelming fan response to the SOLD OUT September 2013 inaugural event. Norman Reedus, star of the hit series The Walking Dead™, will headline the initial celebrity guest list at April's 2014 FanX. Reedus will be joined at FanX by Walking Dead co-star Chandler Riggs, Brent Spiner and Marina Sirtis from Star Trek: The Next Generation™, Kelly Hu from X2:X-Men United™ and Adam Baldwin of Firefly. Over 100 additional celebrities and guests will be announced between now and the April event. SALT LAKE CITY, July 26, 2013 -- Due to unprecedented ticket sales and expected attendance, organizers of Salt Lake Comic Con (SLCC) today announced that the convention will move from the South Towne Expo Center to the downtown Salt Palace Convention Center in Salt Lake City for its inaugural event on September 5-7, 2013. 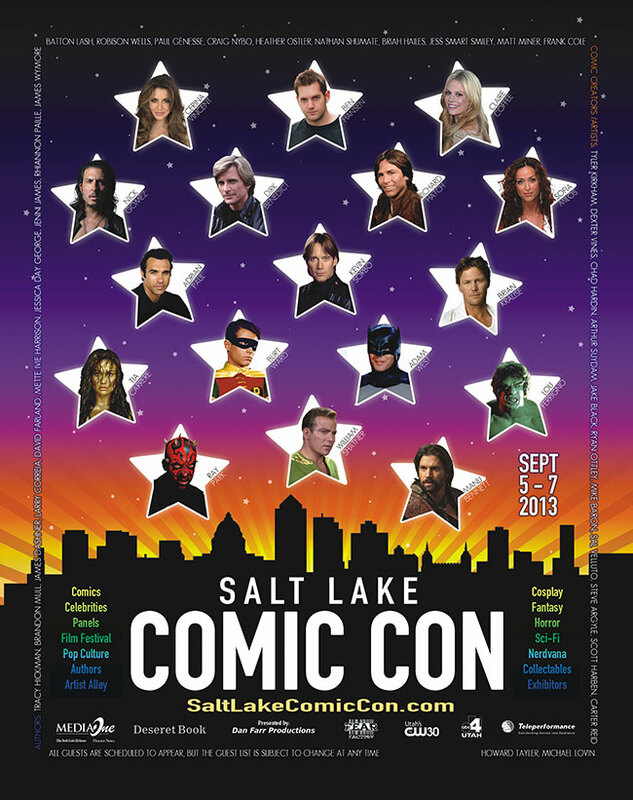 Information about VIP, 3-Day and Single Day Ticket sales are available at www.SaltLakeComicCon.com. "We're excited to make the best in gaming, comics, TV, movies, technology and pop culture available and to bring the incredible Comic Con experience to the huge fan base in the Intermountain region," said Dan Farr, Show Producer. "Never before has there been this many celebrities, comic creators and bestselling authors gathered in one place and accessible for fan interaction, photos and autograph opportunities."